This week, we bring you more awesome chick rock with the Video Clip for a song called “Captain’s Dead,” from Atlanta’s The Coathangers. 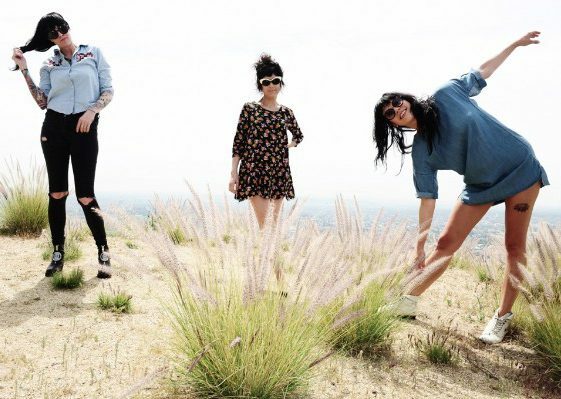 The Coathangers first stormed on the scene over a decade ago, with their power firmly rooted in their ability to craft a crooked hook out of a grimy guitar line, a delightfully crass chorus, or an enticingly ham-fisted drum-and-bass groove. And it seems that they are still doing that! The Coathangers’ mastery of pop cannot be contained, as is evidenced by “Captain’s Dead,” with its sultry verses, triumphant chorus, and a bombastic freak-out of noisy guitar. Visually, the video is all kinds of crazy fun, and what stands out most for me is the ladies’ great skill in applying eye make up like 1970’s-era Alice Cooper! Check it out and tell me you don’t agree. “Captain’s Dead” is the first single from the band’s upcoming EP, Parasite (on Suicide Squeeze Records), whose cover art depicts the group as sirens of the sea, an image that aptly captures the EP’s nautical themes! On Parasite, The Coathangers explore the space between their initial unbridled expressionism and their recent nuanced song craft. Says guitarist/vocalist Julia Kugel of the sequencing of the EP’s five songs, “I’d like to think we take you on a journey through the band’s existence.” Awesome. For vinyl fetishists, Suicide Squeeze is proud to offer Parasite as a one-sided 12” on Sea Green Vinyl, with a b-side etching, in an initial limited pressing of 2000 copies! The EP will also be available digitally worldwide on June 30th, 2017. Enjoy!